Kathryn Bigelow is a director whose last two movies focused on America’s modern warfare. She dealt with the hunt for Osama bin Laden in “Zero Dark Thirty,” and the psychology of soldiers in “The Hurt Locker.” Both of these films delivered layered stories that offered close looks at our nation’s involvement overseas and deep studies of the characters at the center of them. For her latest movie, “Detroit,” Bigelow turns to one of America’s most tumultuous events: the Detroit riot of 1967. While the film is unsettling, upsetting, and unflinching in its depictions of this occurrence, it’s not enough when trying to bring a full picture of a major turning point for race relations within our country. In 1967, tensions have risen between law enforcement and African-Americans, with riots having practically gutted the infrastructure of Detroit. It all reaches a frightening crescendo on the nights of July 25 and 26, when a troop of police officers visits the Algiers Motel to investigate gunfire and end up violently interrogating a group of suspects. The whole cast delivers fine performances, such as those from John Boyega and Anthony Mackie, but they’re sadly underused. Out of the whole cast, the two standouts are Will Poulter and Algee Smith. Poulter gives a brutal performance as a police officer who is relentless in his pursuit of those who he thinks are guilty. Although his performance is relatively one-note (chalk that up to the screenwriting) he achieves whatever he can with the material and displays a frightening presence because of how far his character is willing to go to get what he wants. Despite Poulter’s memorable work in the film, Algee Smith, who plays an aspiring R&B performer, has the only role with an engaging arc, portraying someone who’s trying to use his musical talents to get out of Detroit, but unexpectedly gets caught up in the violence of the riots. It’s a moving performance, one that manages to bring out a glimmer of hope in the end, even after everything that takes place earlier. The screenplay by Mark Boal, who wrote “Zero Dark Thirty” and “The Hurt Locker,” doesn’t quite live up to the work he did for those two films. While he dealt with the intricacies of the hunt for bin Laden in the latter and the mindset of a bomb-disposing army sergeant in the former, he doesn’t seem to capture the full scale of his subject this time around, limiting the film to just one part of the five day riot for most of the movie. Aside from the film’s limited scope of the riot, the narrative is also brought down at times by some heavy-handed bits of dialogue that seem below Boal’s screenwriting talents. Although the occurrence at the motel was a significant part of the riot, it would have helped the narrative to dedicate a bit more time to the days of the riot that led up to what happened at the Algiers. We get some of this in the first half hour, but then almost the whole rest of the movie is spent on the Algiers, with the trials of the accused officers coming in the last 20 minutes and feeling rushed. The riot was a devastating event in 20th-century American history, and the film should have focused on the broader picture of it instead of just limiting itself to one night for most of the runtime. Despite the movie already being almost two and a half hours, the story should have been about another half hour longer to allow us to see even more of what happened during those five days and what came after. 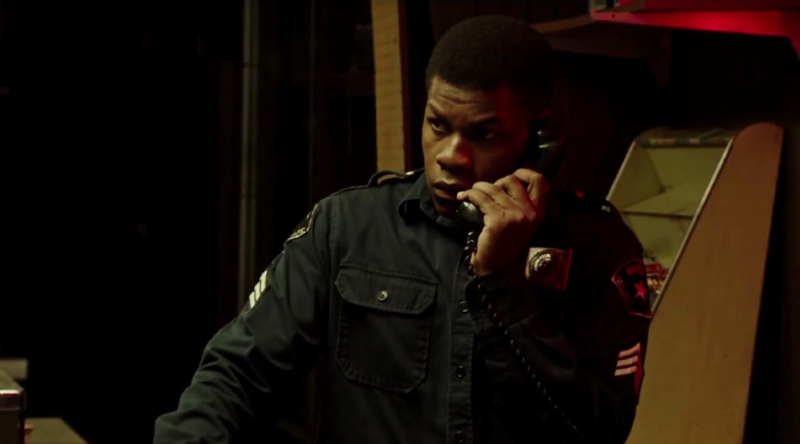 During his last two collaborations with Bigelow, Boal wrote main characters who were complicated, but he doesn’t do so with “Detroit.” The possibility to accomplish this is present with Boyega’s role, given how his character is an African-American security guard who must uphold the law, while also trying to uphold a positive reputation amongst other African-Americans. This is a plot point that could have provided a thought-provoking dilemma for his character, but instead it’s a situation that’s addressed in only one or two scenes. It also wouldn’t have hurt to make Poulter’s character more layered. I’m certainly not saying that his character should be more likable or sympathetic, but Boal maybe should have added a little bit more to Poulter’s role, instead of just having “racist police officer”be his only defining trait. Bigelow has the ability to enthrall us in her filmmaking, like when she kept us on edge during the compound raid in “Zero Dark Thirty”and the bomb disposal scenes in “The Hurt Locker.” While she makes you feel the intensity of the situation in “Detroit,” thanks to the hectic, yet assured camerawork from cinematographer Barry Ackroyd, who shot “The Hurt Locker,” most of the movie seems to rely on exploitative and repetitive depictions of the violence at the Algiers, representing a big step down from the more ambitious stories of Bigelow’s last two films. This marks her third time in which she has brought politically and socially relevant stories to film, and although “Detroit” couldn’t be more timely in its arrival, it isn’t the hard-hitting exploration of events that these riots should have been given.